TEAMBUILD ENGINEERING & CONSTRUCTION PTE. 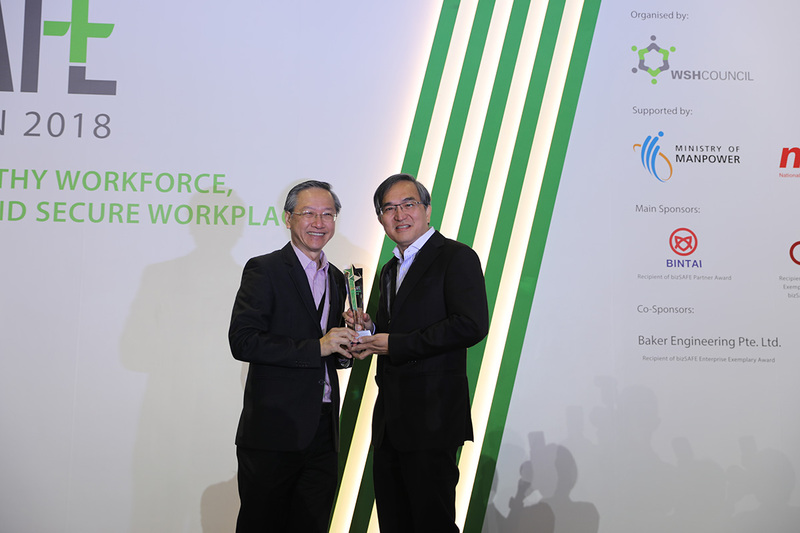 LTD.
More than 800 participants attended the 10th annual bizSAFE Convention on 7 February 2018 to celebrate the achievements of the bizSAFE community, comprising nearly 30,000 companies, which together employ over 1.3 million workers. Teambuild was honoured to receive 4 awards in the bizSAFE Convention. Executive Director Mr. Johnny Lim received TBEC bizSAFE Partner Award, Operation Director Mr. Lee Kay Sin received TBEC bizSAFE Enterprise Exemplary Award, WSHO Mr. Lim Yi Hong, Allen received TBEC bizSAFE Champion Award and Director Mr. Lee Keh Ha received ABC bizSAFE Enterprise Exemplary Award. Congratulations and well done to all those who contributed in one way or another to this milestone achievement!